Missions are random 'dungeon' areas that are generated by the game with a goal in mind. These missions are excellent for getting training and experience in the field as well as the cash necessary to bankroll your character. Missions are generally given out by mission terminals that can be found in any city on Rubi-Ka; although, there are missions that are given out by NPCs in the higher level Shadowlands gardens, as well as the Outzones Staging Area by the Unicorns. Some missions will use the random dungeon generator of the mission system. For a level 100, for example, missions are available in the following QLs: 180, 150, 130, 120, 110, 100, 90, 85, 80, 75, 70. Typing in chat, /tell helpbot level <X>, where X is your level, will give you all your available missions. You can access your missions panel by pressing Ctrl + 4 or clicking on the Missions button. This will open your Missions panel where you can see the icons for your current missions. Right-clicking the mission entry and choosing Upload to Map from the drop-down menu causes the mission location to be portrayed on the Planet Map at the point of the arrow under a white M, and on the PF Map as a small white x. Missions can be deleted from the same drop-down menu. There are two types of mission booths: individual and team. These are found only in Rubi-Ka and do not exist on Jobe. There are Neutral, Clan and Omni-Tek mission booths. To get a mission, you would right-click on a mission booth. This will bring up a screen with a selection of missions. This screen has six boxes on it, and will display 5 missions when you click on the Request Missions buttons. There is a drop-down arrow that will bring up a selection of sliders that affects the type of missions you want to do. When the slider is set to Order, for example, the missions are known to spawn more human enemies, whereas Chaos spawns more 'monster' type mobs. You select a mission from the mission terminal by clicking on it, then clicking the Accept Mission button. Each mission will put a mission key in your inventory. This is a temporary item and cannot be moved to a backpack. This mission key will disappear when you complete the mission or when the mission expires. Missions from mission booths typically expire 48 hours after they are received. Mission keys can be duplicated with a duplicator, which can be purchased from a shop, from the Tools kiosk. The different types of missions and the qualities of the missions you roll with the mission terminal can be changed using the mission option sliders. 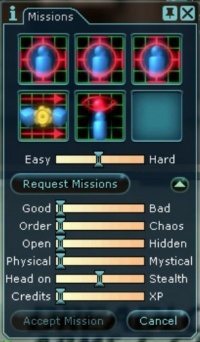 There are six different sliders that each influence different qualities of the mission: Good/Bad, Order/Chaos, Open/Hidden, Physical/Mystical, Headon/Stealth, Money/XP. Good/Bad - This slider will have an effect on the degree of violence in the missions you get. Full Good results in more observation, find item, or retrieval missions, while Full Bad will give a higher percentage of kill missions. Order/Chaos - This slider effects the types of mobs you will encounter in a mission. Set all the way to the 'Order' end will produce a higher percentage of human or robotic enemies (good for acquiring weapon drops to sell), while the 'Chaos' end will have more monsters and humanoid monsters (good for acquiring Miy's Armor). Open/Hidden - Missions that are more open have less locked doors and less locked chests while hidden missions have more. It should be noted that more difficult missions have higher chances of having locked doors and chests. For low level characters, full hidden missions are a boon because of the very large xp bonus for unlocking doors compared to the skill required. Physical/Mystical - A mission that is 'Physical' will have more weapon oriented mobs like Enforcers, Soldiers, or Martial Artists. A Mystical mission has more caster style mobs such as Doctors, Nano-Technicians, and Meta-Physicists. Head On/Stealth - This influences mob behavior so that a full 'Head On' mission will have mobs who are more likely to aggress a character on sight and bring others with, and a full 'Stealth' mission has mobs that are less likely to do this so it is easier to sneak past them. Money/XP - A very simple slider group: it controls how the reward of the mission leans. Missions that are 'full money' are popular; the XP reward of missions is often considered to be less worth while than the cash. One can always go back and do more missions, or any other kind of XP levelling, to get more experience, but one can not go back to a previous level to get more money. On the other hand, selling items obtained in missions can be very lucrative, and the higher one levels, the greater all kinds of money rewards tend to be. You will be asked to find a named MOB in a mission. In the mission, you would locate the named MOB, click on them and then wait until the mission completes, it will usually take a second or two to register. You will be asked to find an item in a mission. Typically, these items appear as small pyramids with a blue Q on them, a black square with a red and white Q or as a thin grey rectangle. In the mission, you would locate this item, click on it and then wait until the mission completes. (You may also pick up the item to complete the mission.) This is the easiest type of mission to blitz. You will be asked to find an item in a mission and then return this item to the mission terminal. You must return the item to the same mission terminal where you got the mission, so it is very important to remember which terminal you got the mission from. In the mission, you would locate this item, double-click on it to pick it up, then return to the mission terminal, click on the item and, with the item on your cursor, right-click the mission terminal. You will be asked to either rescue a person from a container or to repair a device. You will be given an item when you receive the mission. 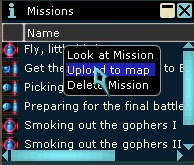 In the mission, you would locate the container or device, then click the mission item and, with the mission item on your cursor, right-click the container or device. This kind of missions can be obtained only from an NPC (as part of a mission) and not from a mission booth. Basically, it's just like Recover Item, but you should return the item not to the terminal, but to the mission giver. Sometimes locating and getting to a mission is the hardest part of the whole process. While your combat ability allows you to curb stomp every mob in a mission, there is no game stat that effects your personal ability to find the mission. There are some important tools that can help you though. Maps are wonderful and amazing things, especially in Anarchy Online, for a couple of reasons. The first is that the wider world map is customizable or skinnable by players, so many different groups of players have made many different types of skinned world maps to fit different needs. So before you even think about picking up any missions, you should go to the Maps Page and look into the possibility of a map to use other than the default map. Each of the maps generally come with labels of areas, rectified map geometry, points of interest, NPC locations, tower zone locations, city locations, and travel areas. Once you have a better map, you can generally upload your mission details to the map and get a way point marker that tells you the area you need to go to. In general, you want to try and get as close to the mission using the Grid or Whompah system as you can, because it saves you from running there. Preferably you want to start your trip to the mission site within the same zone, but some times this is impossible, eg there are no Whompahs or normal Grid exits in Milky Way. If you cannot get into the same zone as the mission from a major city or grid exit, than you will have to travel overland there. Once you are in the area though, and the mission is uploaded to the map, you will get a nice orange dot on your compass that will tell you what way you have to travel in a straight line to get to the mission. Often times the best way to travel is by flying. This can either be in a Yalmaha, a Phasefront vehicle, or with a nano program. Flying allows you to bypass many of the random wandering monsters found in the overland, as well as avoid going over rough terrain or getting trapped in odd geometry, which makes travel faster. If you cannot fly, than you need to run to a mission, which means facing all the problems or running past them. Fixer run buffs are generally best for this. The last real option, which is often times only viable if you are doing a team mission, is getting an Engineer to warp you directly to the mission site, but this requires -them- to go there on their own without the way points you have (unless its a team mission), and many engineers are not too thrilled about going far out of their way for anything less than a huge tip. Characters can be Beacon Warped into and out of mission instances, or even from one mission instance to another, even without mission keys. When you get to the mission site, the way to get into your mission will be a door or other hole in the ground. It is time consuming to click on the reward icon in each mission description, looking for a specific item. Imagine if you could search nearly one item per second, without even having to touch the keyboard. Well, you can. Clicksaver is a third party program fully integrated with the Anarchy Online mission terminal system to display mission rewards and search for items specified by the player. Clicksaver is neither supported by Funcom, nor against its rules to use; this differs from many online games, that forbid all third party programs. It is so synonymous in most player's minds with the terms 'blitz' or 'roll', that they seldom mention it specifically. Missions will often contain a variety of chests and containers that will contain a variety of random loot. Some of these will be very obvious, like chests, bags, and barrels; but some are a little harder to spot, such as boxes, piles of junk, or lone skulls. 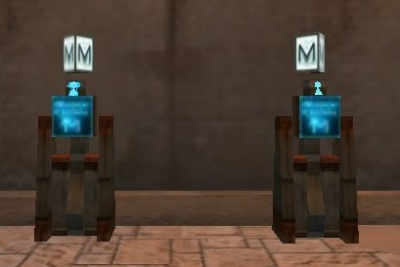 Chests and Barrels can also be locked, and when locked are generally locked at a higher difficulty than doors in the same mission. If a chest or barrel is locked, it can also be trapped; and when triggered can release monsters, blind openers, or unleash an area effect bomb blast. It is good to note though, that higher lock difficulty means better XP rewards when opened. Blitzing a mission means to complete the mission in the shortest possible amount of time, preferably without having to kill anything. This is done in order to receive the item reward for the mission. Find Item missions are favored for blitzing as the item can be found and picked up. There is no need to wait for the mission to complete. Typically, blitzing is done by buffing Runspeed, AC and health and then running through mission ahead of the mobs trying to attack you. It is also possible to sneak through missions to get the item without killing anything; however, as this requires high Concealment, this is typically done by agents. A third type of mission blitzing can be done by professions with calming or rooting abilities, where they simply calm all the mobs in a mission, which results in a free ticket to the goal and an easy stroll out. Along with an item, XP and/or money, there is another reward for missions successfully completed. This reward is called a token. Tokens can be earned by Clan and Omni-Tek characters. Neutrals cannot earn tokens. Tokens are used with side token boards and grant special bonuses. In order to receive a token for a mission, you must kill a certain amount of the mobs in the mission. Killing all of the mobs gives you a 100% chance of receiving a token. You have a lesser chance of receiving a token if you kill fewer mobs. You will know when you have a chance of receiving a token and what percentage of a chance you have because a message will appear along with your XP for a kill, telling you this. This message only appears after you have killed a threshold number of mobs. This number varies from mission to mission. Until you receive this message, you have no chance of receiving a token. The token that you receive is a single icon that appears in your inventory. When you right-click on the token, it will update your token board with a variable number of tokens depending on your level. Backpacks. Many items drop as loot during missions. You do not want to run out of inventory space, as this can result in not receiving the reward for the mission. Lockpick. Some doors and containers are locked even in low-level missions. In order to unlock these, you need a lockpick. Lockpicks can be purchased from the shop, from the Tools kiosk. You need Break & Entry skill to use a lockpick. Bomb Disarming Tool. Some doors and containers are trapped even in low-level missions. Traps include spawning animals, blindness and damage. These are available from the shop, from the Tools kiosk. You need Trap Disarm skill to use a bomb disarming tool. This tool is not essential for mision success, but at low levels these traps can be deadly. Animals spawned usually count towards the percentage chance of receiving a token. Med kits, nano kits and first aid. It's always important to be able to heal yourself. Ammunition. If your weapon requires ammunition, make sure you have plenty of it before you go on a mission. A light source. Many missions are very dark. Having some form of light source, such as night vision goggles, is a must. 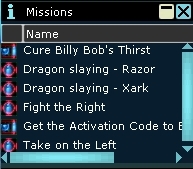 Unique Missions can be obtained from specific NPCs, rather than a mission terminal, and are displayed identically on the Missions Panel. The required time for completion is often much longer, though. Some of these tasks are the only way to get unique Armor or Weapons or other items in Anarchy Online. Others are needed to gain access to different places or as a help in the Shadowlands. There are also missions that are just there to make a small change in the normal daily run. Most of these are from the early beginning of Anarchy Online; some are still required today and worth doing for some professions. These are missions that are available once every 18 hours for all Rubi-Ka players of all levels. With the Add-on Shadowlands many new missions where introduced. Most of them are to gain access and allow faster traveling between the new gardens. Others are needed to gain playfield access. With the latest patches there are also a lot of small missions that allow players to find out more about the Storyline and Anarchy Online history, and to give players a break from killing Hecklers. The last Add-On Alien Invasion brought some new missions. Both Omni and Clan contacts have planned offensives against Enemy Camps, and you are their operative of choice. Strategic and tactical maneuvers against the Kyr'ozch aliens. This page was last edited on 3 January 2019, at 21:18.